This system of interlocking pieces is designed to look like the city that Spiderman lives in. 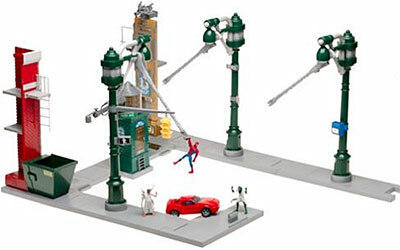 The special magnetic stunt action Spiderman can be set up to independently swing from web to web and perform a variety of stunts. To further evoke the imagination the whole system can be arranged in a number of senarios. A variety of kid-powered features are also built in to actively involve them in the fun. Two three-inch magnetic stunt action Spiderman Figures and three-inch Dock Ock and Lizard are included with a pull back and go chase car.